There is a lack of transparency surrounding the indefinite leave of South Lake Tahoe City Manager Nancy Kerry. That was the take from several residents who commented at a special meeting of City Council on Monday, Feb. 12. The only item on the agenda for the meeting — a meeting that two councilmembers said they did not understand the reason for — was the discipline, dismissal or release of a public employee for discussion in closed session. No action was reported after the closed session. However, the city did confirm to the Tribune on Monday that Kerry was placed on leave last Tuesday — whether she chose or was placed on leave was previously unknown — but could not provide additional information on the status of Kerry’s employment. She was placed on leave after the city hired an outside firm, Municipal Resource Group, LLC, to evaluate Kerry in October. 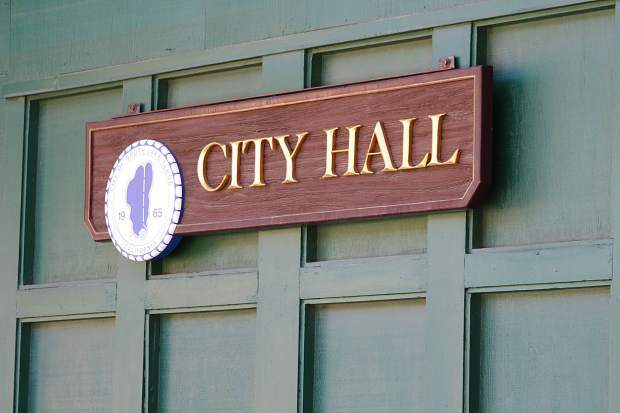 The results of the evaluation were presented by MRG partner Mary Egan and discussed by council in two closed-session meetings in January and February prior to the announcement of Kerry’s leave and South Lake Tahoe Fire Rescue Chief Jeff Meston’s appointment to acting city manager. As previously reported, an investigation by the Tribune revealed that some former and current city employees credit Kerry for creating a “toxic” workplace where yelling and “bullying” were commonplace. The Tribune could not confirm what specifically led to this recent review just four months after Kerry’s last evaluation, in which she received an “excellent performance review” and a 5-percent raise. The Tribune has been unable to reach Kerry for comment since she was placed on leave. At Monday’s meeting, attorney and former councilmember Bruce Grego asked City Council during public comment to conduct their discussions in open session. “Is it going to be possible for parties involved to waive closed session so that we the public can hear what is really happening? Because there is not enough information coming out from the city and it seems to me that you need some transparency here,” said Grego. City Attorney Nira Doherty said that it was up to the employee to waive that right to closed session discussion, not the city. “It’s not just the Brown Act that limits the council’s ability to be transparent; it’s also labor laws that protect the confidentiality of personnel information, and those laws ensure that employees have the right to have their personnel information remain confidential,” Doherty later told the Tribune. The Brown Act created California’s laws governing public meetings and disclosure, among other provisions. Councilmembers Brooke Laine and Tom Davis both expressed confusion about the purpose of Monday’s meeting and why Kerry was not present. Kerry did not respond to a message left by the Tribune Monday. Former mayor and councilmember Hal Cole and South Lake Tahoe Realtor David Kurtzman spoke during public comment, raising concerns over potential violations of the Brown Act committed by City Council. Doherty said the contract could be on the Feb. 20 or March 6 council meeting agenda. Nikki Moore, legal counsel at the California News Publishers Association, disagreed with Doherty’s defense.